As a young alum working at my alma mater, each fall, I’m awash with memories of my orientation at the same time as the new class begins flooding campus. My own orientation was filled with names and faces and meeting people in person who I had so happily met and fallen head-over-heads in friend-crush with through our Class of 2010 Facebook group. Even as an administrator, I have been deeply involved with the incoming class on Facebook. I knew I had to do something to try and meet as many of these fascinating new students in person as possible, so I pulled out my trusty dragon backpack, filled it with the necessities (camera, iPad, water bottle and business cards) and informed my audience of my outfit on Facebook and Twitter. My plan was to embrace the “social” part of my social media coordinator job title. This turned out to be a magical introduction. Most students (and parents!) recognized my name or identified my outfit from my Facebook post and were really excited to become involved with the two social media projects I had created for move-in day. The first was a simple photo project, a snapshot of a new student (or students, if a roommate was also around) plus something to represent Oberlin or the class of 2015 in the photo. I got shirts (worn, held up to smiling faces or modeled on a sibling who was helping move in), sweatshirts, blankets, bracelets, IDs, lanyards and the ubiquitous hand signs for OC or 15 if it was too early in the unpacking process to have the Oberlin swag unpacked. Parents love photos of their kids. My mom is guilty of this. Each time I blog or post photo albums, she’s always looking for photos of myself or my brother and points it out when she doesn’t see either of us. I managed to get photos of about a tenth of our incoming class—and moms and dads everywhere are happy. “I wish I had taken more pictures.” My (and Avenue Q’s) mantra of making the most of college is to take lots and lots of photos. Getting our students started and smiling for the camera on day one encourages them to continue smiling for four more years. Class unity (and campus pride) is important. 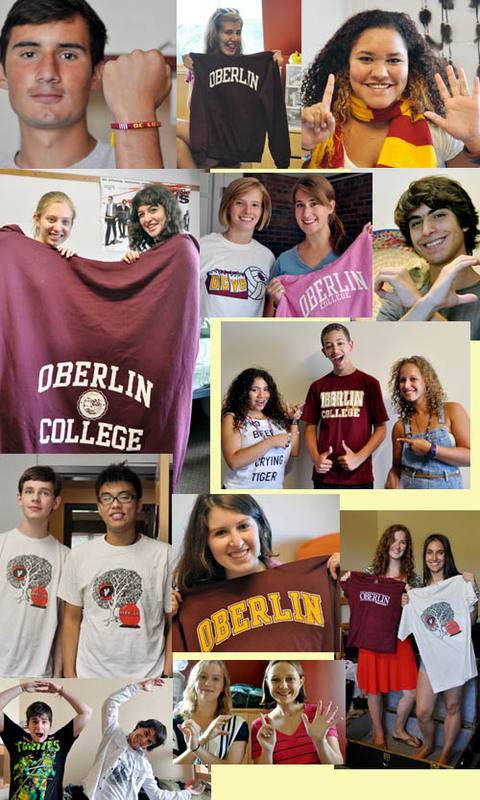 By having students represent their year or their connection to Oberlin, it made for a really cohesive album of images that clearly state these students’ connections to our school. What is your name? Secret: This was also so I would be able to learn the names of as many people as possible. It was a mild success. I can identify a great number of students by name and face at this point! What is your class affiliation? This allowed me to talk to transfers and double-degree students without getting into a confusing class year discussion. Most students said 2015, first year or freshman. What is one thing you’re most excited about for the upcoming year? After a few students were unable to choose just one thing, I asked students for a sentence’s worth of exciting things, which actually gave me content to work with later. I had planned to shoot videos just on move-in day, but many other interview opportunities arose during orientation so I extended the interviews through the end of the week. What emerged were a few gigabytes of spectacular videos of glowing incoming students in a variety of dorm rooms as well as inside, outside and hanging out in groups, grinning like their lives depended on it and with their voices dripping with the most natural enthusiasm possible. Need proof? See for yourself. New students are willing and ready to talk to practically everyone. It helps that I had a reason to be popping around and saying hi. Everyone already knew my name and it was time for me to do my part and start meeting Internet people in real life. Parents like to know that their kids are in good hands. Having an administrator pop in and say, “Hi! We’re happy you’re here!” is invaluable and good for curbing separation anxiety. Getting students involved on day one is a good, good thing. What better way to get people involved and excited about social media than telling them that they’re a movie star and they should watch themselves on Youtube? What sorts of activities did your campus have planned to welcome the new class?